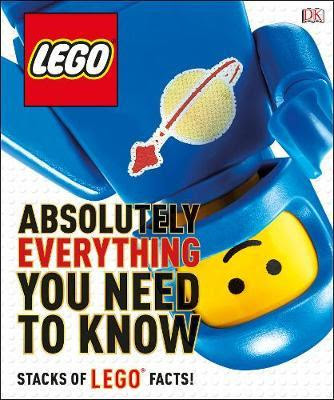 LEGO Absolutely Everything You Need To Know is another fabulous and engaging publication from DK Books. I grew up playing with LEGO. My son received his first LEGO DUPLO set for Christmas when he was only 9 months old and LEGO was a gift that kept giving until his early teenage years. I thought I knew a lot about LEGO. I was wrong. This book kept me exclaiming 'Wow! I didn't know that.' For instance I didn't know that while LEGO was founded in 1932 they didn't manufacture LEGO bricks until 1955. Originally LEGO built toys made from wood and some of their early toys were a fire truck and a duck on wheels. LEGO Absolutely Everything You Need To Know is the right title for this book. It includes information about the bricks and pieces, building worlds, vehicles, mini-figures and much, much more. The pages include photos, fact boxes, brick history boxes, a question and answer section, statistics, timelines, graphs and top 5 lists. There are so many facts to discover that readers will probably like to dip in and out of in this book. If readers want to locate specific information more quickly the contents page and index will be helpful. The book helped me learn the names for many of the LEGO pieces. I found out that the technical names for some of the pieces are; beams, gears, bushes, pins and axles. Until I started to read this book I had never thought about the variety of pieces that LEGO makes eg. doors, picket fences, lattice fences, flowers, barbell weights and even acoustic guitars. I loved the page about the brick colours that LEGO is currently using eg. bright red, dark green, nougat, lavender and olive green. I discovered that in my household we are only the type of fan with a little letter 'f' compared to other Fans who now submit their ideas to become LEGO sets. Just like the LEGO bricks the book, LEGO Absolutely Everything You Need To Know, will provide your LEGO aficionado with hours of fun.